– to the broad man-made Relief Channel. 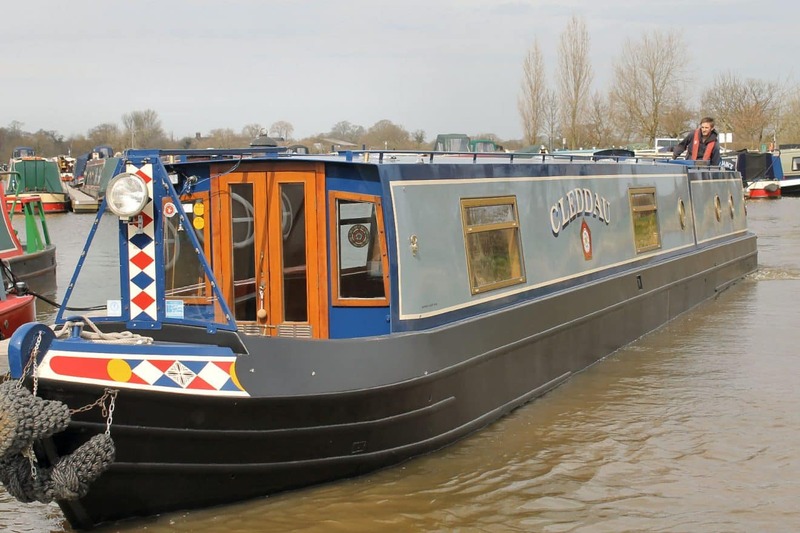 On Saturday Tentatrice and Cleddau left their Wissey moorings, cruised the short distance further north to Denver – and bore right at the Denver Sailing Club to access the Relief Channel Navigation. After the devastating North Sea floods that overwhelmed many East Coast communities in 1953 improvements to river flood banks were made and new infrastructure was constructed to prevent a recurrence of flooding on such a catastrophic scale.The Relief Channel (cut during 1960 – 61) runs parallel to the tidal Ouse from Denver almost to King’s Lynn. It’s 10½ miles in length and is straight – dead straight. 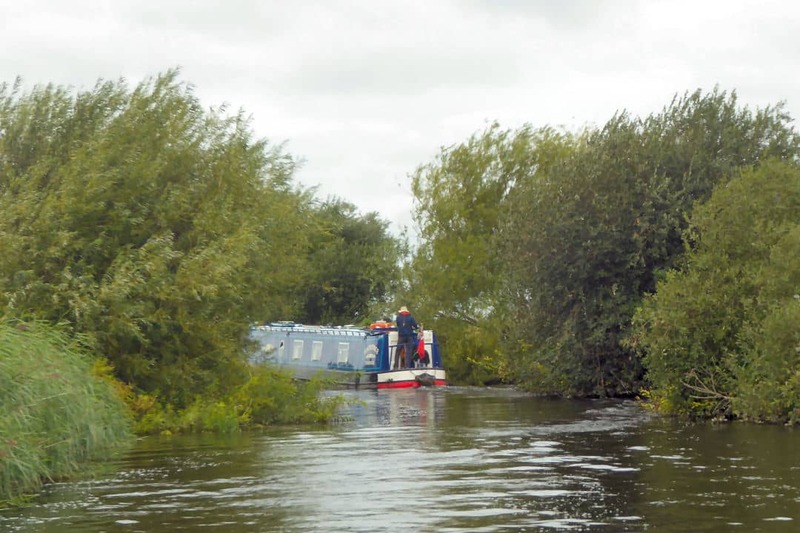 The Environment Agency constructed a lock at Denver in 2001, thus allowing boaters to visit the small fenland town of Downham Market. operated from a control box at either end of the lock. The box at the upper end has a keyboard within it, the small screen relaying the message that you are already logged in… Really?? The boats moved into the lock, were secured with ropes and the press button challenge began. Oh, how wide the Relief Channel is! Locals who know the Channel scoff if you ask whether you can turn a 60 foot boat easily – of course, it is about 200 feet wide. so that a Tesco dash could be made. (Relief as the cupboards were restocked!). and a Gold Award presented last year by Anglia in Bloom. The very striking town clock in the centre of the town was renovated with Lottery Funds in 2004.
and some buildings deserve more than a cursory look. Stowbridge and tying up on the final Relief Channel pontoon at Wiggenhall Mary Magdalen bridge. These pontoons are a delight, each having a water point for boaters’ use. Just visible from the waterway is a church tower; how close to the pontoon would it be? this one over the tidal Great Ouse. (You might spot how the Relief Channel is visible from the river bridge). It was a walk over a bridge that the boat passed under on that murky early morning on 1st June when the boats cruised upstream from King’s Lynn. and just a few yards further on stands the church of Wiggenhall St Mary Magdalen. It was open and a visitor quickly senses that this is an active parish. village folk, young and old, could be pictured hastening to their church. Their village escaped the 1953 floods, not so the next village along where a million sandbags were used to plug a breach in the river bank. (Source: the rector again). another ahead of that. And here the navigation ends. Look hard, boaters, and you’ll spot the small signs either end of the first bridge. but the water is wide and deep. As for moorings there are three separate 48-hour pontoons. before a smooth but slow ascent back up to the Great Ouse. and that would be a fairly long wait.